Valuing learning guild reflection and support times. Building observation into my life so that it became part of my daily routine. Using grounding, taking photos and keeping written journal notes. I have developed skills in designing so that the energy of vision, ideas and need for change is caught within the design framework and then used as efficiently as possible. I addition my Diploma journey has taught me how to manage may own energy levels, needs and patterns, meaning I carry out the different aspects of my life with much more balance. Knowledge, experience and confidence in subjects that at the beginning of my Diploma I would not have thought possible - Having a go at new things. 2 elements that immediately spring to mind are writing for publication, and improving my knowledge and skill with IT. When I signed up for my Diploma I didn’t even use a mobile phone…now I can design websites! I’ve had a gradual and growing awareness of how permaculture design has enabled me to become a far more resilient person. I would now put the care of people at the core of all designs. I firmly believe that unless humans have their physical, emotional, social and spiritual needs met, then they are not going to be able to actively heal and regenerate our Earth and communities. Networking with amazing people and fantastic events. 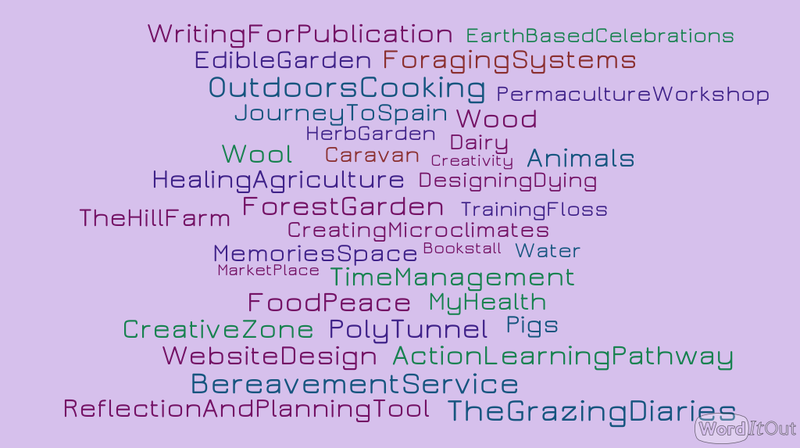 Becoming a lot more involved in the permaculture network. Personal resilience, meaning that I have now learnt about and developed tools which have made me a more effective designer and practitioner in the long term, while respecting my health and wellbeing. My diploma journey has taught me about the holistic benefits of regular evaluation and reflection in all areas of my life, and then using that to make appropriate changes or acknowledge gratitude. The Diploma criteria requires us to show progression in our design work. While I feel I have done this throughout my whole journey, I have also shown how my learning has developed throughout some of my longer term designs. Regular evaluation built into these designs (for example ‘the Hill Farm’, ‘Food peace’ and ‘Animals on the Hill farm’) has meant that I have been able to use feedback from my own thoughts, but also those of others, to develop my designs. I gradually learnt that none of my time was ever a ‘waste’ I could design my time to make every second count, and factoring in rest and ‘pause’ time was just as important as lists/mindmaps of things to achieve. This was a new lesson for me. Design from patterns to details My initial PDC with Patrick Whitefield set me up with an amazing foundation in permaculture theory and applied experience. The Diploma has enabled me to grasp elements of this knowledge that sung to me and then further my understanding, creativity and application of it so much more. Several of my designs (‘The Hill Farm’ ‘Animals on the Hill Farm ‘ and edible garden designs not included in my portfolio were commenced before my first PDC. I have then able to really build on the basic patterns of understanding about permaculture design I had acquired in my life prior to this PDC. The designs in my portfolio miss out many important aspects of my Diploma work, but give a true picture of where my journey has taken me. Patterns in nature, particularly relating to sun and moon cycles have become core to the planning and creativity of my design work. Peer support at many different events, either as established groups or individually, helped enormously. Social media helped greatly in the first half of my diploma, because as an Elders Carer and farmer in a very remote location, I was potentially very isolated. My Diploma and my life became one journey together. Integrating my Diploma work with my roles as Carer, Farmer and Nurse enhanced these roles. - Implementing my Journey to Spain design. Writing, blog, articles, book reviews. Creating and using my own website and related social media. Establishing, and being a regular contributor to the Diploma Face Book group. Reflecting back over my many designs I can identify how using this principle has helped my design work to effectively progress through my Diploma. At the start of my Diploma I used design processes, principles and tools in my work that I felt familiar with and a reasonable level of confidence to use. Over the 4 years I have gradually used processes, tools and principles I had less knowledge about, giving me chance to explore their usefulness in different design subjects. Use and value diversity I have undertaken a much wider diversity of designs than I had ever thought possible. 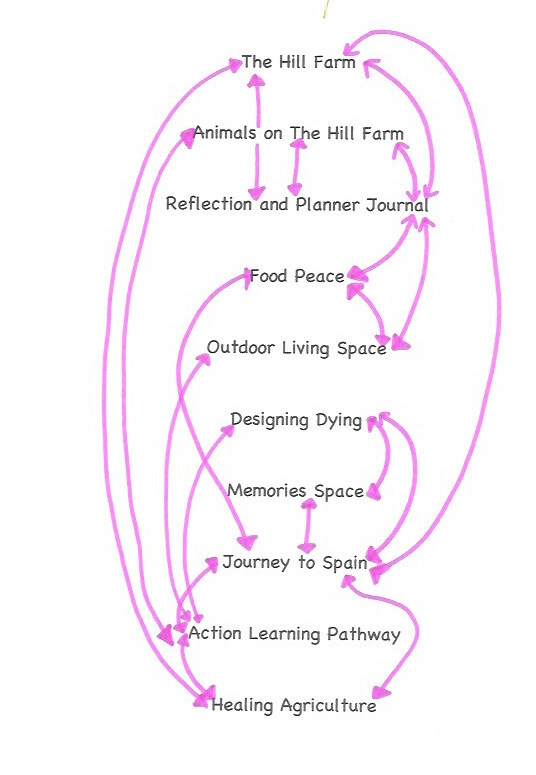 Looking back on my learning pathway created at the start of my Diploma, most of my design ideas were farm related land based ones. My final portfolio designs show a very different mix. The Earth Activist Training PDC with Starhawk and Charles Williams massively opened my whole being up to the true enormity of not valuing diversity, both in our histories and in the present. As a privileged white middleclass healthy woman I left California feeling quite shaken and broken with guilt and shame. The experience provided me with a renewed determination to ensure I considered diversity and privilege as being fundamental in all aspects of my permaculture work and life. The experience of undertaking the Diploma has lead me to a deep understanding that my experience of often feeling on the edge of many social, work and other life circles is actually an incredibly productive and valued place to be. Its something I now celebrate in my life. The design subjects used in much of my Diploma work have been described as some as been at the Edge of ‘typical’ permaculture work. These subjects include Designing for End of Life, Upland Farming and combining Earth based Spirituality with broad scale agriculture. Much of my design work and other experiences as a Diploma Apprentice have not only developed more resilience when managing change, but have encouraged me to reclaim creativity as an essential part of this. I have used creativity in adapting and creating various Design tools when I identified that my work would benefit from something that sat ‘outside the box’ of tools available to me. A good example of this is a design tool I created to integrate aspects of earth-based spirituality, using ideas taken from Starhawk’s book The Earth Path. In addition, as I have developed as a permaculture designer apprentice, I have demonstrated how adapting and integrating design processes has been beneficial to my designs and wider learning.